How many Canadian prescriptions may I order? There are no restrictions on the number of prescriptions you can order - only on the quantity of each prescription. This is an important key to understanding shipments from Canadian pharmacies. Canadian pharmacies are allowed by US Customs to mail you UP TO a 90-day supply of your prescription medications in any given shipment. The 90-day supply is determined by the doctor's directions on the actual prescription and NOT based on the dispensing number. For instance, if your doctor has prescribed you 1 tablet per day of cholesterol medication, we will only be allowed to send you 90 days of that particular medication in any given shipment. 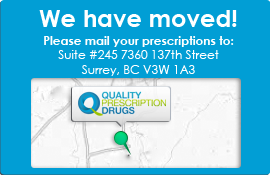 Our Canadian licensed doctors will review your prescriptions and then "co-sign" your original prescription in order for it to be filled at our Canadian pharmacies. Our physicians also "co-sign" any refills which your doctor has indicated on the prescription. Most of our patients ask their doctors to have prescriptions written for 1 year, or three refills. This makes the process of refilling a simple 5 minute phone call. Remember, the 90-day supply is for each particular medication. If you are currently taking two medications regularly, then we will be allowed to ship both of the medications in 90-day quantities only. The restrictions are only based on the quantity of each medication and not the total number of medications an individual is taking. Check with your doctor to see that he/she has indicated each of these three important quantities on your prescription. Some doctors may forget to explicitly indicate the number of refills your prescription is valid for. In this case, your prescription will be signed as valid for one fill and zero refills.